This tutorial is for painting Knight Models' Black Widow. All paints from Army Painter's Warpaint range. The body suit was first basecoated with black. The reflections from the overhead light will be used to determine the placement of the highlights. I applied a dark grey mix made from black and uniform grey over most of the body, leaving black in the recesses and joints. The main technique I used for painting the highlights on the suit was glazing. I made a lighter grey mix of uniform grey, a small amount of black and a lot of water. After loading my brush with what amounted to grey coloured water I wiped this against a piece of kitchen towel. This removed most of the water from the brush leaving a small amount of pigment behind. I used the side of the brush to apply a broad stroke moving in the direction of dark to light. Starting with such a dark base colour means the first few layers probably won't be visible. But with repeated application the highlights will get stronger and stronger. At some point I decided to add little dots and scratches of almost white to give the suit some texture and strength to the highlights. I also added a little turquoise to the mix as I didn't like how the neutral grey was looking. To finish off the suit I used glazes of black to restore the shading. The hair was given a layer of diluted lava orange. Rather than work from an opaque basecolour I painted lava orange, fur brown and chaotic red onto different parts of the hair in an attempt to recreate the natural variation that occurs in human hair. I used glazes of strong tone, flesh tone and red tone to add definition and unify the hair colour. Some highlights were added with a mix of lava orange and skeleton bone. The skin was basecoated with a mix of barbarian flesh and skeleton bone. I washed the face with diluted flesh tone. Glazes of flesh tone were used on the cheeks, lips and around the nose. The wristbands were basecoated with daemonic yellow. Washed first with desert yellow. Then a mix of soft tone and flesh tone. And finally highlighted with white. For other Marvel Universe models check out my tutorials page. Thank you for this tutorial it was very helpfull. Any chance for Infinity tutorials? I doubt I'll do any infinity tutorials as Mr Giraldez has that covered with his books. Got the Masterclass 1 part and im rather disappointed (useless bust section, some unexplained techniques, gaps in step by step). 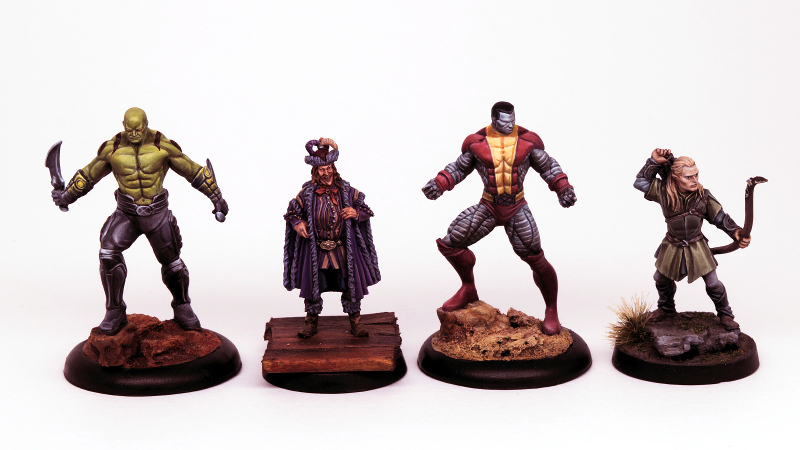 There is so many Infinity miniatures not cover by his publications/posts, so there is still plenty of space for other tutorials, like Druze Hacker etc. Really like your tutorial, looking forward to applying some of the techniques to my Black Widow model when I get her.